Ito Shogi, or "String Shogi," is a one-dimensional chess variant, and is essentially an outgrowth of Rutherford's 1-dimensional Shogi. Ito Shogi is an attempt to simplify the rules of the former game, yet complicate the tactics and strategies involved. The majority of chess variants play in two dimensions, and several of them are quite entertaining. Adding a third dimension has become quite popular, resulting in a plethora of enjoyable 3D chess games. There are even a few variants with four or more dimensions, some of them very clever (i.e. "Timeline"). But ironically, creating a playable and enjoyable one-dimensional game of chess is perhaps a more serious challenge than one might think. A few variants exist, but most of these suffer from a handful of fatal flaws. For instance, unless one plays very poorly, material trade-offs tend to be equal, and the game ends in a King vs. King draw, or one side (usually the first player) winds up with a single piece advantage that wins the day. Some game inventors were clever enough to complicate the game sufficiently to avoid such a game of attrition. Sadly, most of these still result in drawish positions, where the first player to show any real aggression suffers material loss, permanently crippling his/her game. The strategy that players quickly learn is to just sit back, and wait for the opponent to make a mistake. Though all of these variants are certainly intriguing, most are not fully analyzable or playable/replayable. A few variants are pretty innovative and successful in their solution to the "1-D chess variant problem." These would include "String Chess" and "One Ring Chess". But as I reflected upon what it would take to make a truly great game, I had an epiphany: Shogi! Shogi variants are remarkably versatile, forming the largest chess games I know ("Tai Shogi," "Taikyoku Shogi") as well as the smallest ("Micro-Shogi", "Nana Shogi", and even "Gufuushogi"). By virtue of its immortal pieces, it lends itself to miniaturization far better than any other chess game I know of. Naturally, a single-dimensional game would have to be fairly small; Shogi certainly would fit the bill. Also, the aforementioned problem of attrition is easily avoided when playing a Shogi variant; just drop your captured pieces back into play. Shogi and its many variants offer so many preexisting pieces to choose from, it was unnecessary for me to invent any pieces of my own. I simply had to adapt the moves of those already in existence for one-dimensional play. For all these reasons, I chose Shogi to hopefully create an entertaining one-dimensional chess variant. While presenting this game, it is assumed that the reader is already familiar with the rules of Shogi. The Ito Shogi board consists of 21 squares in a single file. Like all Shogi variants, its squares are uncheckered. However, because some of the moves are difficult to visualize without the checkered pattern, every other square has "notches" in its corners. The picture to the left shows the trays where players keep their pieces "in hand," but such is not necessary, if players feel that it detracts from the game's claim to having only one dimension. -	Forward and backward movement remains exactly as its two-dimensional equivalent move. -	Diagonal moves are converted to a jump to the second space, i.e. a piece that could normally move 1 square to either of the forward diagonals now jumps to the 2nd square forward, 2 squares diagonal are a jump to the 4th orthogonal, etc. Notice that this maintains the "colorbound" nature of diagonal moves. -	Sideways moves are completely ignored. Capturing is of course by displacement. All pieces except the Gold Cannon capture in the same fashion as they move. As in Shogi, the object of Ito Shogi is to checkmate the King. Stalemates are illegal, though the likelihood of their occurrence is quite small in any case. Captured pieces become the property of the captor, and as such may be re-entered on to any vacant square as that player's turn, subject to only one restriction: It may not be dropped to any square behind that player's own King. Unlike Shogi, a piece may be dropped or moved onto a square from which it may not make any further moves. Also unlike Shogi, pieces may be dropped at either value. Dropping with the weaker valued side face-up can present strategic advantages at times, especially when expecting to make an immediate capture (see promotion rule below). Promotions are as in Micro-Shogi; that is, every time a piece makes a capture, it automatically is flipped so that the opposite face is showing, and the piece assumes the properties of that face. Upon making another capture, the piece is again flipped. This promotion/demotion may take place any number of times throughout the game. The King is never flipped. As in Shogi, there is a prohibition against repetition of moves: If players create a previous position for the third time (including pieces in hand and the same player to move), the move must be retracted and a new one played. Pardon the grayscale pictures, but I needed to use small files. Again, as a reminder, all pieces move and capture in the same manner, except for the Gold Cannon. Both its move and capture are shown above. 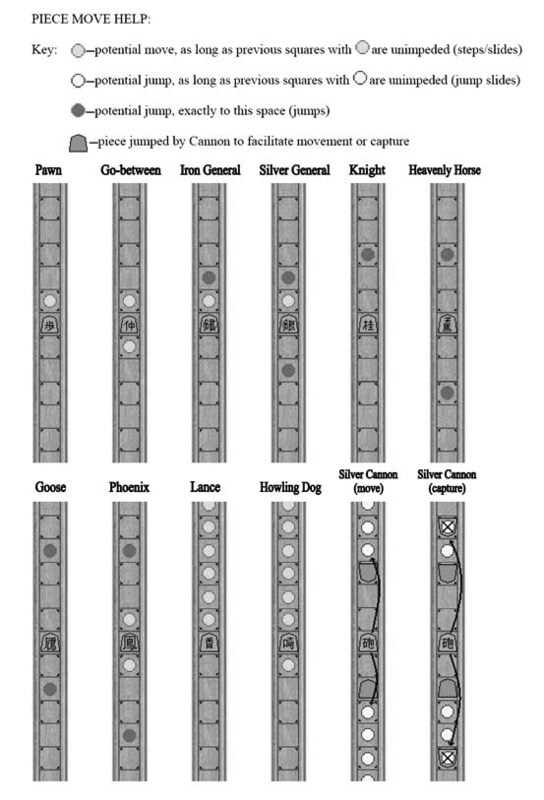 The Silver Cannon's capture and move, though identical in functionality, are shown above simply for clarity. Note that from the opening position, four different pieces are able to make the first move. This allows for varied openings. Also, be aware that a King that has moved forward from its initial position is very vulnerable to drops from behind. Remember, however, that no single piece can successfully mate the King from behind, unless the King is smothered by his own pieces; otherwise, it always requires at least two pieces to pull off a rear assault. The Goose/Phoenix piece is very effective at smothered attacks and smothered mate. It is wise to give your King some breathing room early on, especially if you end up trading your Goose/Phoenix. The Cannon may be a very valuable defensive piece if kept near the King. 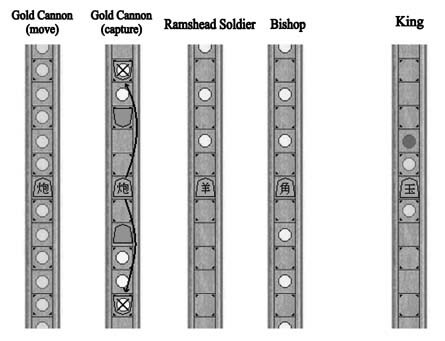 Any opposing piece that does make its way behind the King can be easily eliminated by the Cannon, provided, provided the Ramshead Soldier has moved from its initial position. A Cannon may be quite effective as an offensive piece as well, especially when in hand. Observe that a Silver Cannon is probably better in a defensive position, while the Gold Cannon is better in an offensive position (contrasting 2-D games, where the Gold Cannon is almost always superior). -	Use the crowded space to force your opponent into initiating exchanges. This often results in his/her loss of material. -	Conversely, take advantage of the initial exchange, even if material is lost. If planned carefully, the resulting sacrifice of material can force the opposing King into a vulnerable position from which he may be more easily mated. -	When making exchanges, don't be too hasty to return your pieces to the playing field. If the opposing King is found in a vulnerable position, a few sacrificial drops can prepare him for a final mate-delivering drop. However, do not allow your opponent to drop all his/her pieces without dropping some of your own. Your opponent may overwhelm you before you get into position for a mating attack. Remember to have fun! You are playing what I hope is the best one-dimensional chess variant in existence! Larry L. Smith, who gave me the idea for "notched corners," preserving the Oriental feel of the game, while allowing easier visualization of many of the moves. Also for his suggestions in the past and his extensive help with Rutherford's 1-dimensional Shogi, this game's predecessor. Steve Evans, for reviewing my rules and helping me clarify them, as well as identifying this game's strong points and giving encouragement. Also, if he had not created his Shogi software, I may have never fallen in love with Japanese chess, and therefore would have never created this game in the first place. R. Wayne Schmittberger, for finding strategic flaws with Rutherford's 1-dimensional Shogi, which I have tried to remedy in Ito Shogi. Malcolm Webb, for programming the Zillions file for this game, which exposed flaws in earlier design, and his patience as I meticulously made alterations to the rules. After having designed this game, it has become somewhat apparent when testing on Zillions of Games that at higher levels of play the gote (White, or second player) has a significant advantage. At lower levels, it doesn't appear to be too noticeable. However, I would like to see this game reach a status as one of the great Shogi games, but I need to further perfect it. Please give any feedback and suggestions, and if I incorporate your ideas, you will be properly credited.